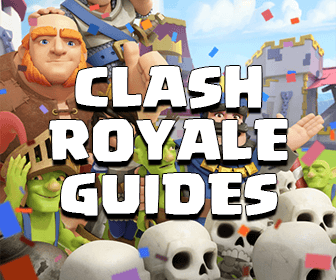 Throughout the course of time, Supercell has released numerous Clash of Clans updates for the purpose of fixing bugs, balancing the game as well as adding new items, troops and features. 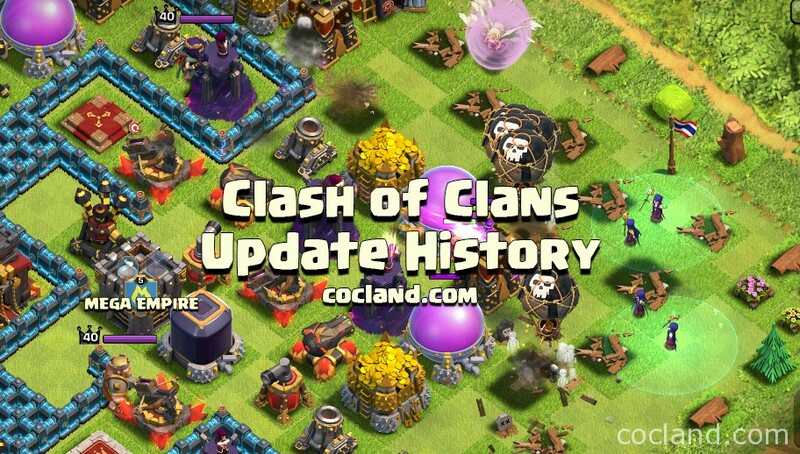 Have you ever been curious about the update history of Clash of Clans? This page gives you everything about that! Improved Freeze, Lightning, Earthquake and Poison Spells. Unlocked Lightning Spell level 7 at Town Hall 10. Town Hall 10 has 25 more walls. Clan Wars Tiebreaker is out and based on the total destruction. New level 11 Walls appearance. For more information of this update, you can take a look at its individual page at here. Here is the main post of this update on cocland. Added the new Dark Spell Factory with 3 new spells: Poison Spell, Earthquake Spell and the Haste Spell. Added level 5 Dragon at Town Hall 10. Moved the level 4 Dragon upgrade to Town Hall 9. Added the second Air Sweeper at Town Hall 9. Added new Leagues: Titan and Legend. New A.I. Improvements for Heroes and some troops. New Interface Improvements for Barracks and some small parts in game. Added the Clan Chat Filter Feature for filtering offensive Clan Chat . Reduced the training times of Elixir Spells. Extra spells now can be queued when the Spell Storage is full, like the Barracks. All Spells in game now can’t affect resource storages. Clan Tournaments now last for a month and the winner Clans now have more rewards. Adjusted the cost of Barbarians, Archers, P.E.K.K.As and Dragons. Adjusted the HP of several buildings in game. Inferno Tower in single target mode now can charge a bit faster. Level 4 Dragon has been moved to TH9. Increased the attack speed of Archer Tower. It deals no damage but can push back groups of air troops easily. It just can face one way but you can rotate it. Players can buy Air Sweeper from Town Hall 6. Attacking troops will not start chasing the enemy Clan troops as far away as before. Increased loot in low level single player maps. You now can bookmark any Clan you want to follow by using the + icon in the Clan page. The maximum number of Clans you can follow is 30. Preview your troops, Heroes and Spells before doing any Clan War attack. You can change your name once again. This feature can be unlocked once you hit Town Hall 5. Any Clan setting changes will be shown on the Clan chat sidebar. You now can see the ranges of defenses when they are being upgraded. You now can change the mode of defenses when they are being upgraded. You now can face the enemy bases which have the same TH level as you more than before. Adjusted Clan War Weight system. Earn Clan Perks by leveling up your Clan. Read more details at here. Added Cannon level 13 at Town Hall 10 for better defense. New Opt-in/out Feature for controlling Clan Wars better. Decrease the waiting time between each troop request. Get refund for each donated troop. Get more bonus loot in Clan Wars. Increase the level of donated troops. You now can save plenty of layouts at a time for both normal and Clan War base and switch between them easily. You can edit inactive layouts whenever you want. Added level 12 Gold Mines and Elixir Collectors at Town Hall 8. Added level 7 Giants at Town Hall 10. You now can compare your clan to other Clans in the Clan Local Leaderboards! You now can watch the live attack If your village is being attacked when you logged in. Improve the Hero Ability icons. The resume boost button shows the remaining time. New level icon for troops and Heroes. Prevent spamming join request by limiting it to maximum 10 requests. You now just can use Elixir for upgrading walls level 9 and higher. You now can buy the first Dark Elixir Drill at Town Hall 7 and the second one at Town Hall 8. Increased the maximum capacity of Dark Elixir Drill at all levels. Archer Towers now shoot twice as fast as before but the damage per second is still unchanged. Inferno Towers can shoot for a longer time before getting depleted. Adjusted HP of some buildings. New trap: The Skeleton Trap! Can be used to distract the enemy troops with small groups of Skeletons. You can set the Skeleton Trap to either air or ground mode. You can buy the Skeleton Trap at Town Hall 8. Added the 4th Mortar at Town Hall 8 for better game balance. Added the Halloween Headstone obstacles. By clearing it, you will earn 50k Elixir. Increased War bonus and League bonus. Boost all buildings of a type with just one button. All boosts will be paused immediately If there is any maintenance. Visitors now can see the Army Camp’s contents. Reduced the time for cleaning obstacles. Increased the War loot capacity in the Clan Castle. Added new air Dark Elixir Troop – Lava Hound. Added Barbarian and Archer level 7 at Town Hall 10. Added Archer Tower level 13. New Dark Elixir Barracks level 6 for unlocking the Lava Hound. Walls level 6 and above can be upgraded by Elixir. Players can now upgrade a row of walls. Added pause button and some new improvements for Clan War replays. Reduced the Hero regeneration time at all levels. Reduced the training time of Valkyries. Better A.I improvements for Healers. From now, she will always stick with a group of troops. Defending Clan troops use all 4 doors to come out. You now can remove troops from the Army Camps and Clan castle. Spells are brewed in the same order when they were selected. Added Jump Spell level 3. Added Hidden Tesla level 8. Inferno Towers in multi-mode is now slower at burning. Troops are now smarter at breaking walls. Hog Riders now take more damage from Giant Bombs than before. Reduced the training costs of P.E.K.K.As. Added live match in Clan Wars. You now can re-arm all your traps and buildings by just tapping on your Town Hall. Clan mail now can be longer than before. You can copy your normal layout to your Clan War layout with just one button. Now you can keep a separate layout for your War Base. 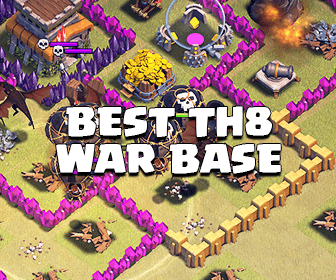 You can edit your War base layout easily in the Clan Wars section, of course in the Preparation day! 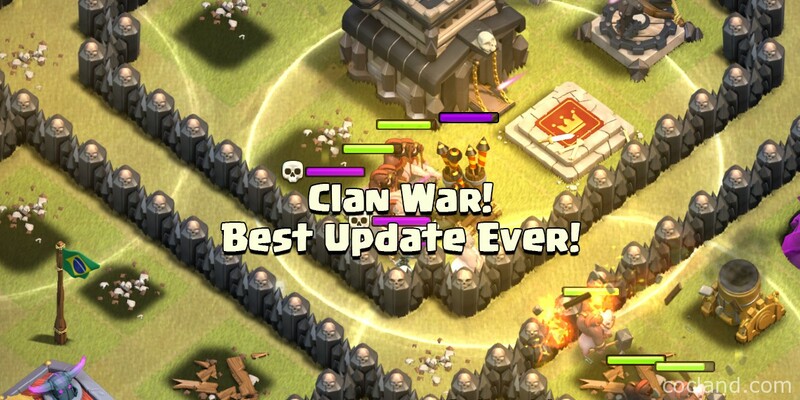 After upgrading your Town Hall, new buildings will not be placed in your Clan War layout automatically. You need to do that manually. You can change the mode of your X-Bows and Inferno buildings If they are being upgraded. You now can see all statistics of your Clan in the Clan Wars menu. Added most heroic victory and most heroic defense replays. You can remove any troop in your Clan War Clan Castle. Once the Clan War is started/canceled, there will be a notice in the chat sidebar. All bases on the war map are now numbered. Added notification sounds for Clan Wars. Clan Wars Update is identify the biggest update ever! Let’s fight against other Clans to see who is better and earn bonus loot after each match. Clan War doesn’t affect your shield, trophies or resources. Added 2 new achievements related to Clan Wars are War Hero and Spoils of War! Added Clan Castle level 6. Clan Castle is now used for protecting the Clan War bonus. The higher level Clan Castle is, the more loot It can hold. Only your Clan mates can see what troops are in your Clan Castle. The Gem Box is back with 25 Gems for every box. Decreased the Clan Castle level 5 upgrade cost. If you see something wrong, please comment and help cocland improve this page. From now, Clash of Clans Land will use this page as the main one for posting and updating all Clash of Clans updates so we can track/follow them easier.